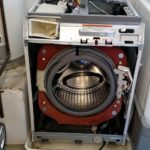 Does your washing machine not drain? When your washing machine isn’t draining properly, it could be that your washing machine’s drain pump has malfunctioned. 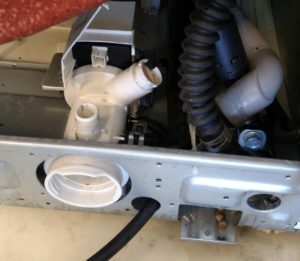 We provide affordable Samsung Washer Drain Pump repair service in San Diego, Chula Vista, and surrounding areas. 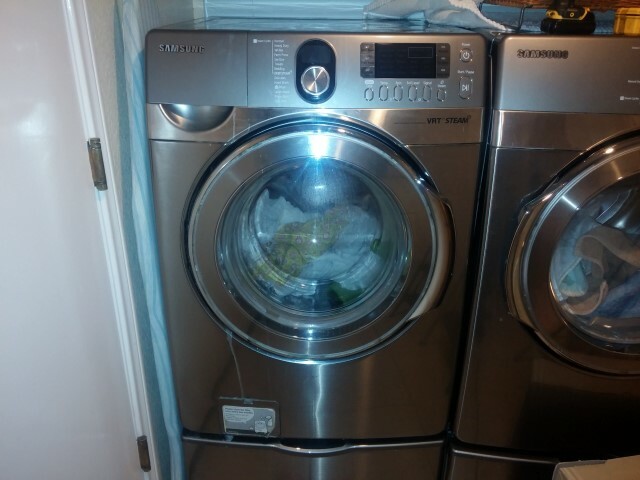 The Samsung washing machine pictured in this article had a malfunctioning drain pump. To complete the repair, we started by ordering the replacement part. With parts ready, we start by disassembling the machine enough to get to the broken drain pump. Parts naturally fail over time. Some parts fail faster than others due to hardened water. Hard water has minerals in it that can clog up pumps. Once the pump has a good amount of build-up on it, it will stop working correctly. Hard water is not always the cause of the problem though. Many other issues ranging from manufacturer defects to power surges can cause appliance parts to fail. 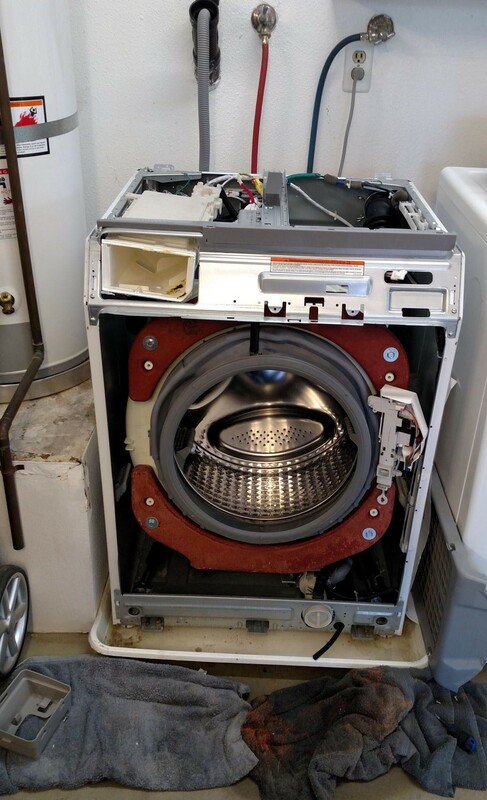 An experienced appliance repair technician will usually be able to tell what the cause of failure was. 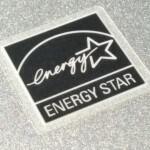 We repair all major brand name appliances and appliance types in San Diego. We repair drain pumps all Samsung washers, and many other brands of washing machines. 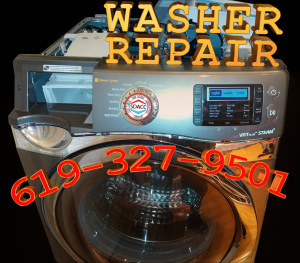 If you are in need of washer repair service in San Diego, we’re here to help. 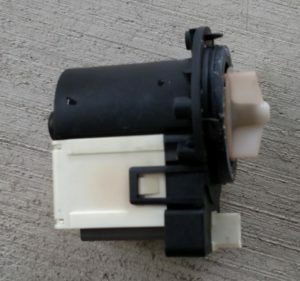 The broken drain pump from a front-loading Samsung washing machine. Our service call fee is only $30 and is waived when you have your appliance repaired by us. 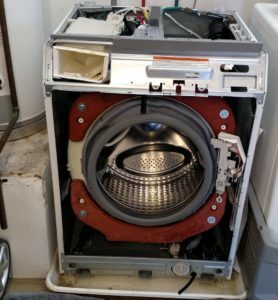 The exact cost of repair is unique to each appliance, and each repair. Our technicians will need to diagnose the appliance, and source any replacement parts, before a quote can be accurately prepared. We are able to quickly diagnose and repair all Samsung washing machines, and many other Samsung appliances. Schedule your appointment online, or give us a call at 619-327-9501. A condenser fan motor powers the fan that blows air over the condenser coils. The process transfers the heat away from the refrigerators cooling system and into the environment where the refrigerator is placed. Samsung Refrigerators, like many other refrigerators that have a coil on the back of refrigerator would not require a condenser fan motor repair. Refrigerators that have no coils on the back of the refrigerator are the type of refrigerator that does have a condenser fan system. It is located inside of the refrigerator next to where the condenser coils are located. This fan blows air over the coils and cools the system. This is one very important part of the system that keeps your food cold. The newly installed condenser fan motor. Like many other newer washing machines, this Samsung washing machine is mostly controlled by electronics. Circuit boards control everything from the temperature of the water to detecting when the washer has drained completely. When these electronics fail, your washing machine will stop working correctly.